(c) Calvin Lee, MD, Modesto, CA 2006. 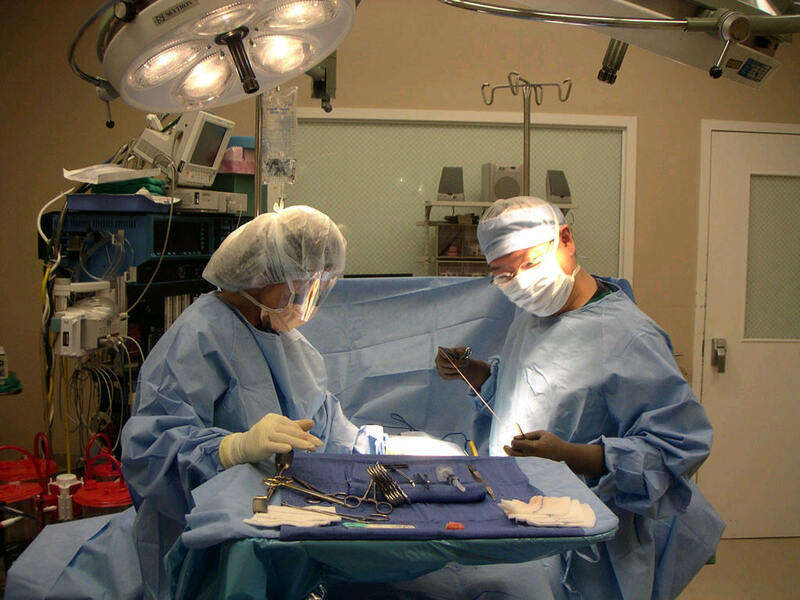 Picture taken in 2004 in a surgicenter in Modesto. This website attempts to answer some of the frequently asked questions regarding hernias, especially inguinal hernias. Dr. Calvin Lee, Modesto Surgeon provides some of his answers on this website. Included on the bottom are some interesting facts about hernias. As a disclaimer, the below information (frequently asked questions/FAQ's) does not substitute for advice obtained personally from a surgeon and a professional consultation. Please consult your physician to verify any of the facts and options below. For the most part this means the groin area. Inguinal hernias can also be called groin hernias. Other names for hernias in this area: "groin bulges, hernia down there, direct or indirect hernia." A hernia is an abnormal bulging of internal organs which break through a normal anatomical barrier. This can happen in different areas of the body. What is the most common types of hernia? The most common type of hernia is called an inguinal hernia. It can be present at birth or develop over the years. There are many materials that hernia meshes are made out of. There are many different "brands" of hernia meshes in different styles. Popular materials for mesh are: Gortex and polypropylene. Gortex is familiar to us as a substance in clothing; however it is modified to be sterile and appropriate for use inside the human body. Polypropylene is a type of plastic, sometimes also called Prolene. As an aside, did you know that Gortex is even used to make a particular type of guitar string? What are the other types of hernias? Hernias can also occur in many other areas of the body including the groin (inguinal hernia or femoral hernia), the middle of the abdomen (epigastric hernia), in the diaphragm (which is the muscle between the abdomen and chest), and around the esophagus (hiatal hernia). Some hernias are quite bothersome or painful. Others cause no symptoms. A hernia may cause tenderness and pressure or discomfort when you bend over, cough or strain. You may notice a lump or bulge at the site of the hernia that moves inward when you push on it. Why is it necessary to have a hernia repaired? Left untreated, a hernia will not go away. It will frequently get bigger. Without surgery, complications are possible. Tissue that is a part of the intestines may become stuck in the hernia, cutting off the blood supply to that tissue. The result can be very serious, and emergency surgery may be required. Who repairs hernias in Modesto, CA? Most General Surgeons in Modesto repair hernias. There are some urologists who also repair inguinal hernias. There are many different methods of hernia repair in Modesto. Ask your doctor in Modesto to see which type of hernia repair is best for you. Different types of hernia repairs include laparoscopic approach, open, different locations of hernia incisions, and different types of hernia mesh. You will undoubtedly have many more questions. Please ask them when you see your doctor. I hope this page has helped you gain more information regarding hernias. As the disclaimers stated above: the information about hernias in this document does not substitute for a personalized visit to your doctor. http://www.herniasolutions.com - a website created by Ethicon, a manufacturer of many medical items including the PHS (prolene hernia system) mesh. Ethicon is a division of Johnson and Johnson. Prolene Hernia System Mesh. Can be used to fix many different types of hernias such as ventral hernias, umbilical hernias, and inguinal hernias. Inguinal hernias are the most common use for this mesh.